As the largest provider of digital signage solutions in South Africa, we provide brand marketers and retailers unique opportunities to reach and engage consumers in-store. We provide innovative digital retail solutions in over a thousand retail outlets, restaurants, and taverns across the country. With offices in Durban, Johannesburg and Cape town, we offer a wide range of digital signage solutions that enable retailers and store owners to create a truly compelling in-store shopping experience. In addition, we offer brand marketers various unique advertising networks in leading supermarkets, forecourts and taverns across South Africa, allowing them to communicate with their consumers in a dynamic and exciting way. Andrew Ridl is the CEO of One Digital Media. He founded the initial company (MerchInt) which was sold to One Digital Media in 2007. He has gained invaluable experience working in Siemens Business Services (Germany and UK). Prior to the above, Andrew was employed by Compaq and Hewlett Packard (Spain, Portugal, Italy and UK) where he managed business transition on EMEA wide outsourcing projects. He has also worked with Network Rail in the UK where he was involved with the initial commercial restructuring of the IS Service and subsequent team restructuring. Andrew completed his BCom degree through University of South Africa. Muhammed holds BSc (Hons) (Finance) and BComm (Hons) (Accounting) degrees from the Universities of Cape Town (UCT) and Natal, and is a Chartered Accounted (SA). After serving articles with PwC in South Africa, he worked in PwC’s Corporate Finance Advisory business in London for three years, gaining broad experience in M&A and general corporate finance. After returning to South Africa in 2010 Muhammed joined RMB, where he worked in the Principal Investments business for two years before joining RMB Ventures. Pearl, a CA(SA), holds a Bachelor of Business Science Finance (Hons) degree from the University of Cape Town. Pearl completed her articles at PwC in 2010 after which she joined their Chicago office for six months. Upon returning to South Africa, Pearl joined the Transaction Advisory business of PwC focusing on company valuations. Pearl joined RMB Corporate Finance in 2011 and spent two and a half years in RMB’s Corporate Finance business gaining experience in general corporate finance and M&A advisory across various industries. Tumi Tlhabanelo is a graduate of the University of Cape Town where he completed Bachelor of Commerce and a Post Graduate Diploma in Accounting (1998), and is also a graduate of the University of Johannesburg where he completed his Advanced Audit Certificate (2001). He is a member of the South African Institute of Chartered Accountants. Tumi serves on the boards of directors of AutoTrader, Waco Africa, One Digital Media, KayDav Group Limited, Peregrine SA Holdings and Nala (Proprietary) Limited. Nthime is a graduate of the University of Cape Town and its Graduate School of Business, where he completed an honours degree in Business Science (1995) and an MBA (1999) respectively. He is also a graduate of the University of Johannesburg where he completed a diploma in company law. Nthime Khoele was most recently a Director of Brait Private Equity. Nthime spent a total of 8 years at Brait, in two separate periods, where his responsibilities included investment origination, structuring, execution and maintenance. Nthime serves on the boards of directors of AutoTrader, Waco Africa and One Digital Media. RMB Ventures is a mid-market, South African private equity investor. As a subsidiary of FirstRand Limited we are an on-balance sheet provider of private equity capital and have invested in over 40 transactions since the mid-1990s. Our close association with Rand Merchant Bank (RMB) gives us access to the full suite of investment banking products. Our history In 1977, RMB was started by entrepreneurs: GT Ferreira, Laurie Dippenaar and Paul Harris, as a niche, structured-finance house – the beginnings of what is now the FirstRand Group. The founding members established their entrepreneurial enterprise on the foundation of Traditional values. Innovative ideas. 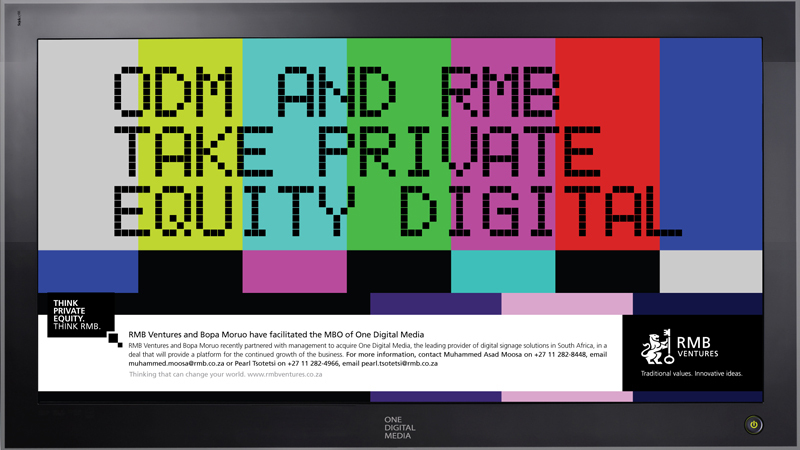 RMB Ventures was born in the mid-1990s, a child of the Corporate Finance business who saw the opportunity to invest in equity alongside RMB’s client base. The team has evolved into one of the largest, most successful private equity franchises in Southern Africa, with a total of eleven transactors – investing in more than 40 businesses over the past 15 years. Bopa Moruo is a South African mid-market private equity firm focused on generating long-term capital appreciation by investing in profitable and growing businesses led by strong management teams. Bopa Moruo is a 100% black-owned company founded by Mr Tumi Tlhabanelo and Mr Nthime Khoele, the principals and sole shareholders, who share extensive experience in professional investment execution and investment management gained at market leading South African and international private equity firms. Bopa Moruo has raised R300 million for Bopa Moruo Private Equity Fund I, a Black Empowered private equity fund, sponsored by RMB Ventures, a subsidiary of FirstRand Limited. The Fund is a general equity fund with a mandate to make minority or control investments across various sectors excluding direct mining, property and primary agriculture. The Fund is classified as a black investor under the B-BBEE Codes of Good Practice and is thus able to make fully funded and appropriately structured BEE investments. At the core of Bopa Moruo's investment approach is a strong emphasis on fundamental value-oriented investment principles, applied with private equity investment management disciplines, to find, build and grow great businesses.